The tight foreign worker policy may finally be working through the wider economy, with companies relying less on labour and changing the way they do business. Bosses told The Straits Times that the lack of manpower means they are having trouble filling vacancies and cannot take on new contracts. Others have restructured some processes in order to manage. 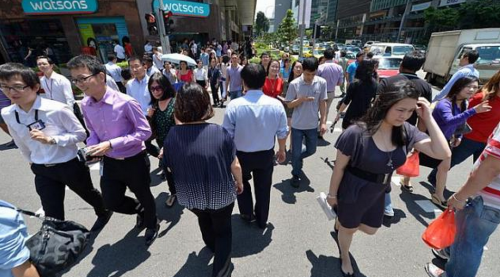 This struggle was borne out in Monday's labour market report, which showed that total employment in Singapore shrank by 6,100 in the first three months of the year. This was the first time the job market contracted since 2009, according to the Manpower Ministry. Besides slowing growth in the local labour force, economists pointed to the tightness in foreign workforce policy as a possible reason for the fall in total employment. The Government tightened policies on foreign workers from 2010, with the goal of weaning companies off the supply of cheap foreign labour. The signs have been encouraging. Last year, annual growth in foreign employment moderated to 2.4 per cent, down from 4.6 per cent in 2013 and 6.8 per cent in 2012. "If employment continues to contract and the economy is still growing, productivity growth may turn positive," said Singapore National Employers Federation executive director Koh Juan Kiat. "It may also reduce our reliance on foreign workers." Employers said they are facing stiff competition for foreign staff. "It's taking a longer time to fill vacancies," said Ms Serene Tan, director of department store chain BHG. For example, she said, information technology staff and managerial level roles take up to six months to fill, compared with two to three months in the past. But vacancies, which fell slightly in the first quarter of the year from a record high, could slip further as companies change their hiring patterns. "Businesses are pacing themselves for the medium to long term," said Association of Small and Medium Enterprises president Kurt Wee, adding that he had seen a slowdown in the number of jobs offered in the last two or three months. Bosses also reported being unable to take on new business. At Tian San Shipping, which has cut foreign hires by about 70 since 2009, senior manager of operations Chin Tze Chung said: "We can't even undertake some tenders because we don't have the manpower." Some smaller companies, such as subcontractors in the construction industry, close down when they are unable to fulfill their existing contracts. Others are considering moving operations to other countries where labour is more accessible. Mr Kelvin Ho, managing director of freight forwarding firm Intercontinental Logistics, said a lack of foreign labour is forcing out many of the factories he relies on for business. "If factories are not coming to Singapore, we might as well close down," he said, adding that he is considering moving the company to somewhere like Jakarta or Vietnam, where hiring would be easier.